Studio Two Three doubling its space in Scott’s Addition | Arts and Culture | Style Weekly - Richmond, VA local news, arts, and events. Non-profit unveiling its new mobile truck at RVA Earth Day this weekend. Recent Style Weekly Women in the Arts honoree, Ashley Hawkins stands next to Studio Two Three's new mobile studio, which will be debuting at RVA Earth Day on April 22. 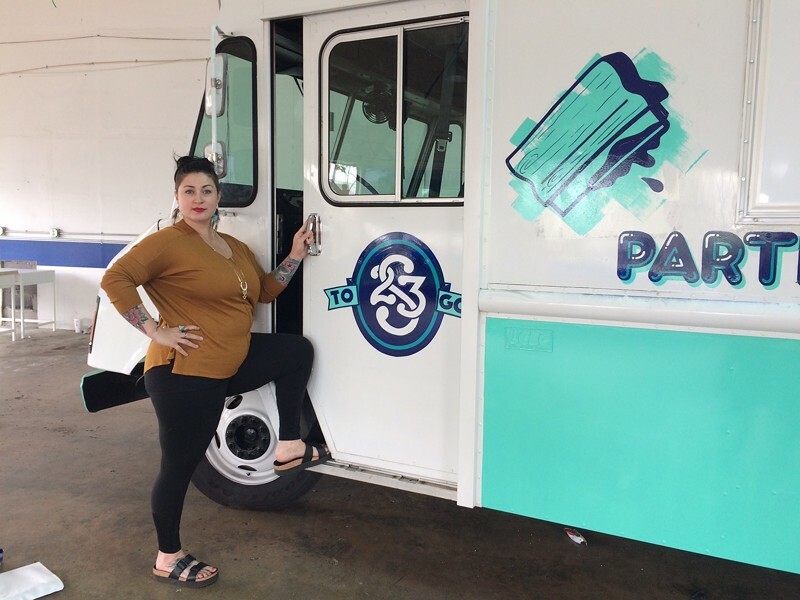 It was seven years in the making, but Studio Two Three Executive Director Ashley Hawkins finally is seeing her dream of a mobile studio printmaking truck to reality this weekend. The truck, a 1999 GMC van with 67,000 miles, recently was purchased by the popular printmaking nonprofit based in Scott’s Addition. Called S23 To-Go, it will be making its inaugural run this weekend to the RVA Earth Day event in Manchester on Saturday, April 22. This will be a mobile printmaking and photography studio as well as retail store on wheels that is styled after ice cream trucks to emphasize art’s ability to delight. But Hawkins believes it will mean much more than that. Hawkins, a recent 2017 Style Weekly Women in the Arts honoree, has been extra busy lately. She’s also about to sign a lease that will double the square footage of Studio Two Three’s existing space at 3300 W. Clay St. with the acquisition of the Delta V auto repair shop next door. “We’re adding 6,000 square feet, 10 new artists’ studios, about a 2,400-square-foot space for classes and events, nonprofit meetings,” she says. “We’ll be quadrupling our classroom educational outreach space. … and we’re hosting crazy things like weddings, too.” With the expansion, the studio will be developing an outdoor green space in the back for film screenings and public events. But first it’s time to unveil the new truck at RVA Earth Day, where they’ll be bringing a specific print design featuring botanicals, as well as the signature Richmond type map and another print that reads, “Protect What You Love.” Also the studio will be taking the truck to the Henrico Arts Festival at Henrico High School this Sunday, April 23. The group is still raising money for the mobile operations, purchasing ongoing materials for the truck – shirts, tote bags, fabric, materials for printing – and also to help pay for field trips to schools that wouldn’t otherwise be able to afford them. In order to buy the truck, they received a Windsor Foundation grant for $30,000, CultureWorks chipped in $15,000 and Golden Rule Foundation gave another $9,000 plus individual donors to round out the amount. Hawkins says the idea for S23 To-Go goes back to her undergraduate days in painting and printmaking at Virginia Commonwealth University. “I went back to take some grant writing classes in 2010, and this was my first practice grant ever,” she recalls. “Seven years later, it’s a reality.” While plans for the truck initially involve travels around the state, Hawkins says she does hope to eventually travel to festivals elsewhere. “We’re pretty well booked through May -- our first field trip will be to Thomas Jefferson High School in early June,” adds Hawkins. It also has an event at Chop Suey Books on May 6 and Dear Neighbor in Church Hill on Sunday, May 7, as well as Mother’s Day at Hardywood Park Craft Brewery on May 14. Not only will the truck be traveling to low income areas free of charge, but it will also bring in money for the nonprofit, Hawkins says, because people will be able to hire the truck out for kids’ birthdays and corporate events. The contact information to bring the truck to your event is togo@studiotwothree.org.